iRead, a flagship program at the King Abdulaziz Center for World Culture (also known as Ithra), that promotes reading through a competition for young people, celebrated its fifth anniversary this month at an award ceremony for the 2018 winners. One of Ithra’s most important cultural initiatives, the iRead competition sees primary, secondary, and university students compete for the coveted “Reader of the Year” title. Saudi Aramco president and CEO Amin Nasser announced the four winners for 2018 last week at an award ceremony attended by officials and Arab thinkers. This year’s winners are Abdullah Al-Mumattin for primary and intermediate level, Tasneem Hammami for secondary level, Kholoud Al-Dabbasi for university level, and — based on the votes of audience members — Sami Al-Battati. Participants submit reviews on a book of their choice, sharing their inspirational reading experience, and 180 entrants are selected and interviewed in Riyadh, Dammam, and Jiddah. award based on votes of the audience. Forty finalists attend a three-week “iRead Enriching Gathering” in Dhahran that involved workshops, lectures, debates, seminars, movies, plays, and musical concerts, where the focus was on reading, creative writing, research methodology, and critical thinking. At the end of the gathering, an academic and cultural panel selected 10 students, who were then invited to compete at the closing ceremony. In addition to naming the winners, Nasser announced a “Cultural and Creative Content Enrichment National Program” to be launched by Ithra in 2019 to generate opportunities in the national creative sector. 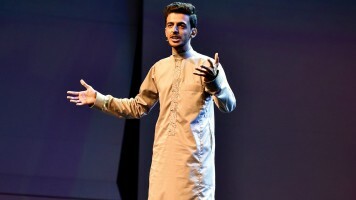 With an expectation to attract more than 100,000 young participants by 2022, Nasser said the program is designed to develop hundreds of cultural products in the fields of writing, filmmaking, visual arts, theater, digital fields and design programs, as well as creative and innovative programs to increase the local content significantly while meeting international standards. iRead since its inception five years ago. Focused on the energy of youth, iRead was launched in 2013 for the youth of the Eastern Province and was expanded in its second year to include the entire Kingdom. The competition was eventually expanded to include preparatory students after initially being limited to secondary and university students. In 2016, more than 14,000 students participated in iRead. The competition is divided into two parts — “Reader of the Year” and “Minute of Reading,” — with a goal of developing critical thinking and oratorical skills. In the “Minute of Reading” competition, the youth upload a 60-second video clip of themselves speaking about a book of their choice. The winner this year is Sharefah Al-Humaid. This year’s “Reader of the Year” program kicked off with new year-long events, a reading forum, cultural lectures, various knowledge activities, and also staged school and social media competitions to encourage students to read. During the last five years, iRead has seen the participation of more than 50,000 people, contributions from 24 writers from the Arab region, and the production of eight movies showcasing the activities of participants. iRead participants have gone on to become poets, writers, bloggers, journalists, cultural activists, novelists, philosophers, and intellectuals. Ithra is a cultural center inspiring people to learn, create and collaborate, in an inviting environment that includes a museum, library, cinema, auditorium, and exhibition halls. Ithra’s iRead national reading competition is distinguished by its careful design to give participants an experience that can serve as a turning point in terms of their knowledge and character.